We thank you for using our Website. We collect personal and non-personal information when you provide it to us in the course of using our Website. The personal information that we may collect includes your name, mailing address, phone number, email address, and financial information. The non-personal information that we may collect includes your server address, your browser type, the URL of the previous website you visited, your ISP, operating system, the date and time of your visit, pages accessed during your visit, documents downloaded from our Website, and your Internet protocol (IP) Address. Unless this Website asks for specific personal information in order to respond to requests for information or to register uses for particular services, only the non-personal information will be collected when you use this site for statistical purposes and to enable us to improve the navigation functions of our web site. When you subscribe to our service we will collect your name, mailing address, telephone number, email address, and other information that we request during the registration process. We may use analytic and reporting technologies to record non-personal information, defined above. Your personal information will only be collected by the staff of Independence Home Mortgage Corp. who have responsibility for responding to such requests or administrating such registrations. However, we may contract with a third party to help us manage, monitor and optimize our Website and measure the effectiveness of our advertising, communications and use of the Website. We may use web beacons and cookies (described below) for this purpose. We use your personal information primarily for our own internal purposes, such as providing, maintaining, evaluating, and improving our Website and the products and services we offer and sell and to provide customer support. We consider protecting the security of your personal information as very important. However, this site does not provide facilities to guarantee the secure transmission of information across the Internet. Whilst reasonable efforts are used to provide security, users should be aware that there are inherent risks in the transmission of information across the Internet. When you enter sensitive information such as a social security number on our registration or order forms, we encrypt that information using secure socket layer technology (sometimes referred to as “SSL”). You may obtain a copy of and request that we correct errors in your personal information by contacting us via the contact information on the Website. If you do desire to obtain a copy of your personal information, you will be required to provide proof of your identity. If your personal information changes or if you no longer want to subscribe to or use the Website, you may correct, update, terminate or deactivate your personal information and your account by contacting Independence Home Mortgage Corp. via the contact information at the top of the Website. There is no fee for requesting access to your information; however, we may charge you the reasonable cost of processing your request. © 2019 Independence Home Mortgage Corp NMLS ID# 122142. All rights reserved. This is not a commitment to make a loan. The terms and conditions in connection with any extension of credit are effective as of the date you receive material and are subject to change within the sole discretion of Independence Home Mortgage Corp without notice. All loans are subject to credit and property approval. Not all products are available for all loan amounts, programs or credit grades. Other restrictions and limitations apply. There are maximum loan amounts. All loan approvals are subject to underwriting guidelines through third party providers. 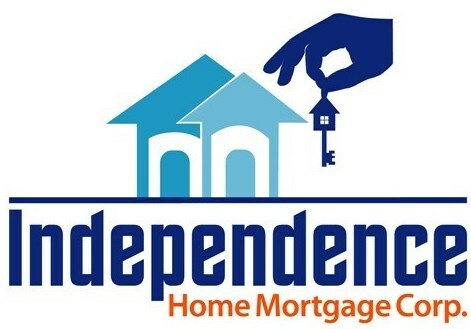 Independence Home Mortgage Corp is a licensed mortgage broker, NJ Department of Banking and Insurance, Pennsylvania Department of Banking and Securities, and Florida Office of Financial Regulation. Registered Mortgage Broker - NYS Department of Financial Services. All loans arranged with Third Party Providers. This site is not authorized by the New York Department of Financial Services. As such, no mortgage loans for properties located in New York will be accepted through this site.